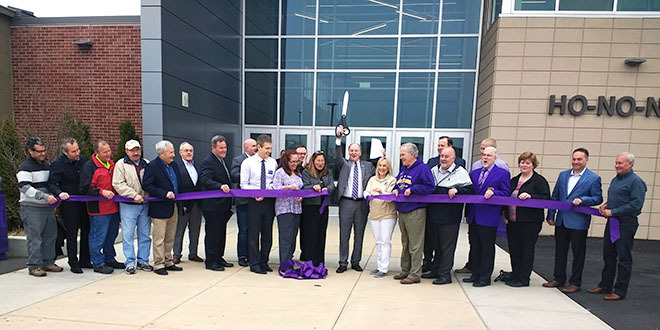 Hononegah School District Board of Education President Dave Kurlinkus, school board members, school personnel and local dignitaries cut the ceremonial ribbon signifying the opening of the $17.8 state-of-the art Hononeagh Fieldhouse, Friday, April 5. Tax payers agreed to support construction of the new facility in a 2017 referendum. The dedication of the Hononegah High School Fieldhouse ribbon-cutting finally arrived, Friday, April 5. It was a meaningful and long anticipated moment for students, faculty, members of the District Board of Education and hundreds of volunteers. Hononegah was built in 1921, nearly 100 years ago. The school has grown steadily in that time. Since 1955, there have been nine additions. The inflated Dome, housing the field house and physical education department collapsed during the winter of 2015. Instead of erecting another similar structure, it was decided that it was time to build a brick and mortar building that would last indefinitely. Dozens of volunteers, many of them Hononegah alumni took to the streets, airways and podiums to talk to the people in the surrounding communities about the need for a new fieldhouse. A referendum was passed in 2017, granting the district permission to seek $17.8 million in bonds to fund construction of the new facility. The District serves Rockton, Roscoe, Shirland and parts of South Beloit. An open house and tours were on-going throughout the day, as hundreds of visitors viewed the state-of-the art basketball court, weight room, offices and a special Decade Wall that told the story through gathered information and pictures from the schools beginning in 1921. Volunteers, under the leadership of retired teacher Tom Polaski spent hundreds of hours gathering information and creating the remembrance wall. There was plenty of room for more than 2,000 Hononegah students to find seats in the bleachers during the morning’s program. According to Superintendent Mike Dugan, it was the first time in the history of the school that it was possible for all the students to fit in the same place at the same time. The program began with a shout-out from Principal Eric Flohr. “Good Morning Hononegah! followed by performances by the school band, cheer squad and dance squad. Kurlinkus introduced representatives from DAL Architect, who designed the building and Ringland Johnson Construction. Special guest speaker Nicole Manske Briscoe, ESPN anchor and a 1998 graduate of Hononegah High School reminisced about her years at Hononegah and congratulated the community for making the new fieldhouse a reality. “This is the kind of facility you would see at a university,” she said. “This is just incredible! Many of the visitors were past Hononeagh student. Jim Benkovich, Roscoe Township Supervisor, said he and five generations of his family have attended the school. His grandfather Goss was on the 1924 school board, his parents graduated from Hononeagh, as did Benkovich and his wife Mavis. Their three sons are graduates and his grand children will soon follow. A sign outside the fieldhouse reads: 3,000 cubic yards of concrete; 5,640 linear ft of piping; 335,913 linear ft of wire and 498 tons of steel were used in the construction. “This building should last for another 100 years,” Kurlinkus said.